The SUNS Academy Under 18s season is off to a positive start, with the team securing a 44-point victory over the NT Thunder at Blacktown International Sportspark on Saturday. In gusty conditions, the energetic Gold Coast team were dominant around the contest, resulting in a 8. 7 (55) to 1. 5 (11) lead at half time to finish the 12.10 (82) to 5.8 (38) victors. After the first-half was controlled by the SUNS, a revitalised Territory side changed the tempo of the game in the third quarter, displaying dashing pace and high skill level to close the score gap. Ultimately, a mixture of defensive marks, tackle pressure and forward half turnovers were the saviour for the SUNS Academy, blocking the flow of the Thunders run late in the third quarter. A scrappy fourth quarter was enough to hold a pressing opposition at bay, with the Gold Coast running in three unanswered goals to reward what was an encouraging first half. 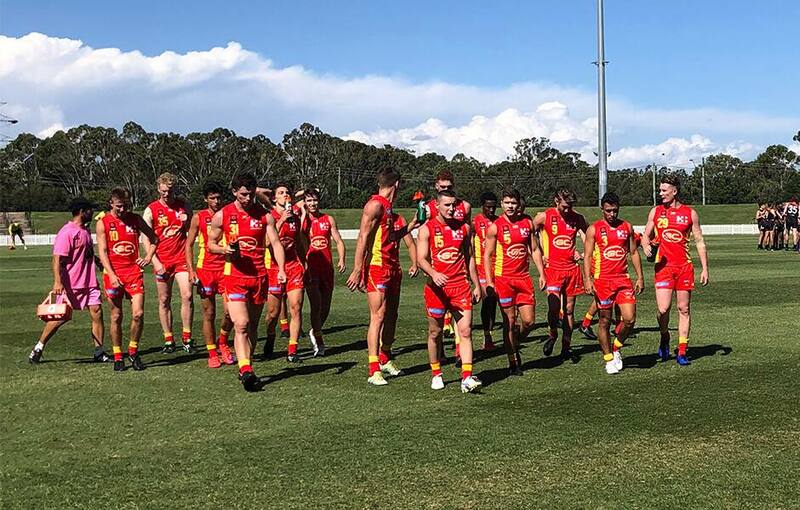 A total of 13 players pulled on the red & gold Academy jumper for the first time this match, setting intent early and showing a sign of bright things to come for both the Academy and SUNS teams. Speaking on the win, Academy Head Coach Andrew Raines said he was impressed with the effort the debutants displayed. “I was really happy with how the young guys played today, we had a lot of bottom aged guys at 17 years of age and they handled the pressure really well,” he said. Raines also said that while the second half was controlled by the Thunder, there were still plenty of positives to come out of the game. “I thought we did really well in the first quarter or two, we were able to put some scoreboard pressure on which set us up well for the remainder of the game." “There’s patches to work on but at this level you’ve got to enjoy the positives in what each individual brings and what the team can do collectively, so I was really happy from that point of view,” he said. Round 2 brings a formidable rival in the Brisbane Lions with SUNS Academy skipper, Connor Budarick, looking forward to the physical battle QClash brings. “It’ll definitely be physical given it’s QClash, and we’ll have to bring that physicality early,” he said.